Do they even sell liquids in the giant cans anymore? We never got them at our house so I was surprised when a friend’s mom pulled one out of the pantry when we were having lunch. It was comically large and I was fascinated that you not only had to poke holes in it but 2 holes on opposite sides! Crazy! wow, never seen one of those can before myself, just the little cans of cream. Only nearly? Gonna need more than that to open those annoying cans. Ever since reading somewhereorother that ordinary every-day events inspire your comics, I’ve wondered what type of events could have caused those comics. I’ve never seen people poke holes in cans of liquids. Can-openers, knives and spoons abound, but never holes. Now try that against a Nokia phone. The magical thing you use to one cans that have liquids in them is a church key (though WHY it’s called that, I have no know). It easily pokes triangular holes in the top of the can and has two sides so you can poke a larger hole at the bottom, and a smaller hole at the top (for air, so it’ll pour quickly and smoothly). Now I’ve moved out and noticed I don’t have one of those… and haven’t needed it for 3 years. Maybe they did stop making those cans O_o? Big cans of Hi-C flavored drink, “now with 1% fruit juice!” or some such. My folks didn’t buy us those very much because we didn’t really like Hi-C — we usually got Kool-Aid in the pouches and mixed at home in a big plastic pitcher. I did like the commercials for Hawaiian Punch but I don’t remember what kind of containers they came in back then because my folks NEVER bought us that stuff. …and what we used the church key to open was 12-ounce cans of Shasta soda pop, before the advent of the pull tabs. I’ve never seen cans like this one before, but my mom says that when she was a kid, coffee powder came in metallic cans that you had to punch a hole in before opening them (or else there would be coffee powder all over the kitchen). I think Juicy Juice also made big cans, but those were actually 100% juice. Usually the majority of it was apple or pear, regardless of what the advertised flavor was. They still make the cans. My wife gets tomato juice for some recipe in them sometimes. I’m not sure why you’d ever poke a hole in the bottom, as suggested above, though; a hole in each side of the top is more than sufficient, especially if you don’t plan to use the whole can. Of course, then you have a can with open air holes sitting in the refrigerator. That juice isn’t going to stay good for long. I happen to carry a church-key, a promotional Nokia bottle opener, and a army surplus P-38 can opener on my keyring. They still come in handy. You should always have at least the P-38 with you at all times. You use a WWII fighter to open cans? Little overkill, isn’t it? Don’t be silly, he was obviously referring to a Walther P38. Some consider the 9X19 underpowered, but I find it’s more than sufficient for the typical can. A shame the unicorn itself apparently isn’t. Congrats on your !500 strip, Chris! Nothing like a unicorn horn to commemorate the occasion! My wife still buys pineapple juice in large cans like this. Awesome. I want to get one of those and drink out of it with a straw in public. Most industrial sized products, the kind normally used for restaurants, come in huge cans. Also, what the heck did Biff use to cut the horn to remove it from the unicorn? Shouldn’t the skull still be attached? 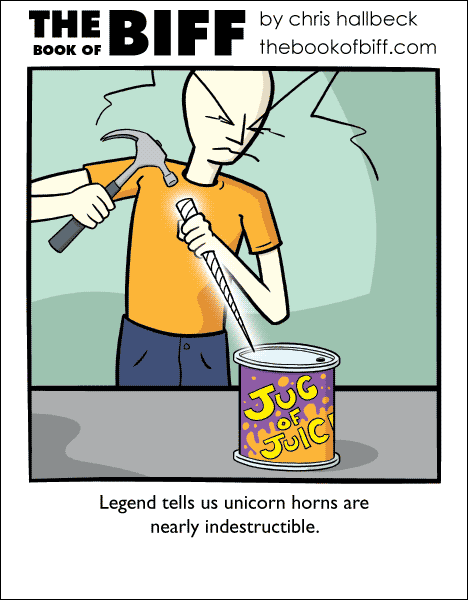 It’s a good idea to use Unicorn Horns for opening cans. If the contents are way beyond the “Best Before” date, the horn is also known as a universal antidote. All food poisoning is neutralized. There goes the unihorn. Nearly indestructible aint gonna cut it. Puncture it.